Grandpa Theo loves that dog. With my current chapter layout, it’ll be awhile before we actually meet the aunts and uncles and cousins and everything. But I know their mention will make everyone curious, so come back on Saturday for a bonus sketch featuring Marta, Antoine, and Clyde! Panel three had me laughing, panel four put me in stitches! And that fan art is beautiful, so melancholy, yet also cute! I agree on all counts. I love the fan art. Dave> Panel three is indeed both! OMG my dog’s name is Clyde! Is it a beagle? Cutest webcomic I’ve ever read, makes me feel all fuzzy inside. Also, Selkie’s speech reminds me of Toki and Skwisgard from Metalocalypse. Hah! I actually had to look that one up! I’ve never watched Death Note except the potato chip clip. The shading does look nice. I love to watch how the art progresses! i think this is the first time ive seen cute ab#nd terrafying combined..
also, that fan art is just so awsome i want to adopt it.. I propose a solution to your dilema. Panel three is neither adorable, nor is it terrifying. It is, drumroll please….ADORIFYING! Adorifying is a good word. I suspect it will come in handy around Selkie. The perfect adjective for much of this comic :). I have to say, I’m impressed that his parents didn’t run screaming after panel three. I thought Selkie had just inexplicably entered Rage Mode in panel three, and was going to fly at them like a crazy flesh-eating leech. Then I read the next line and realized it was just an OMG face. —That drawing is gorgeous, Jillian! She’s so cute. Wonderful storytelling. 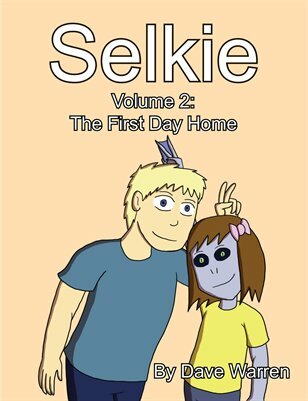 Selkie being an orphan, a child and nonhuman gives her experience of even day-to-day life a “wait a minute– WHAT ?” quality. Being able to pull readers into that perspective is not easy, and a testament to your craft. And yes: lovely fan art, Jillian. When do we get to see Clyde’s room? This comic gives me no end of joy. A DOG WITH HIS OWN ROOM? They must have a fair amount of money if they could afford that! Actually, I suspect Clyde has Todd’s or Marta’s or Antoine’s old room. My ferrets have their own room, and we’re dirt poor, we just live in an old house with one small and two tiny bedrooms instead of two small ones. Panel three is Phenombulously Adorifying. I love that sketch! It’s so… adorifying! Is that the finished drawing? If it is, I’d like to add it to the galleria. I have two daughters. They are my parents’ only grandchildren. They are ferrets. That woman’s a bad egg. Don’t listen to her. DAMNNNNN! Selkie is horrifying in panel 3. Normally she’s at least a little cute, but this nearly made me wet myself! I know, i’m s wuss, but she looks so scary, my little sister was reading this comic (she’s 7) and she FREAKED out at Selkie’s expression. Why is their family incapable of being fertile?